Act I: Ancient Britain. 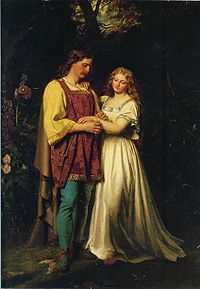 King Cymbeline has remarried, and his current wife (“the Queen”) hopes to wed Cloten, her son by a previous marriage, to Cymbeline’s heir, his daughter Imogen. Cloten, however, is a braggart whom all at court, except his mother and Cymbeline, know is “a thing/Too bad for bad report”. Cloten strikes me as oafish, but not so very bad, yet it’s still early. I’ll keep an eye on him. To complicate matters, Imogen has just married the orphaned Posthumus Leonatus. Posthumus has been banished, Imogen is to be locked away, the Queen has started gathering herbal poisons, and Cymbeline flies into a rage when he sees the unhappy Imogen and Posthumus embracing before their separation. During his exile in Rome, Posthumus brags to Iachimo of his wife’s beauty and constancy, and the inevitable wager ensues. Iachimo claims no woman can resist his charms, Posthumus says Imogen could, and the rest follows. Act I ends with Iachimo trying to bed Imogen by alleging her husband’s unfaithfulness. Imogen’s offended, Iachimo apologizes, she forgives and agrees to keep a trunk for him while he is in Gaul. Her emotional 180 is odd, but perhaps is intended to reveal innocent trust. Curtain drops on Act I. This late play holds echoes of other Shakespearean characters: the Cymbeline/Imogen contretemps looks to be following the lead set by Lear/Cordelia. The Queen brings Lady Macbeth to mind. As for Iachimo, he’s so like Iago that they have the same name (translations of Jacob or James). The plot, a pastiche of Holingshed and Boccaccio, sets the innocent and admirable wedded couple, Imogen and Posthumus, against all who wish to part them. But, unlike Romeo and Juliet, this romance promises a happier ending. What stands out at this point is the complex web of relationships at Cymbeline’s court. The mood is unhappy: in the first scene, two gentlemen note that “You do not meet a man but frowns.” They’re relieved that Imogen is safely wed to Posthumus, whom everyone admires, yet they know a happy resolution is not just around the corner. The fact that Cymbeline prefers Cloten to Posthumus is worrisome for these gentlemen. Meanwhile, the cast of characters includes some Roman officers and soldiers, “apparitions”, and Cymbeline’s two sons (“the eldest of them at three years old,/I’th’swathing clothes the other, from their nursery/were stol’n, and to this hour no guess in knowledge/Which way they went”). Are there perhaps some battle scenes in the offing? Or a haunting? In what manner will the princes reappear? To mention stollen children and then not resolve that mystery would be anathema, especially in a romance. Back in 2 days with news on Act II. This entry was posted in Cymbeline, Shakespeare and tagged Calmgrove, Cymbeline, Shakespeare. Bookmark the permalink. Just getting my notes together for a post later today, but cheered by this excellent summary Lizzie! Agree about the echoes of other plays ringing here: on the page the plotting seems a little too thickened and the metaphors a little mixed but with good direction and intelligent acting this would — so far at least — work well on stage, I think. Thanks, Calmgrove. There are many threads to follow, each looking bleak for Imogen and Posthumus. And what about Iachimo’s trunk? On top of all this: will Cymbeline use an attack by the Romans to wag the dog?